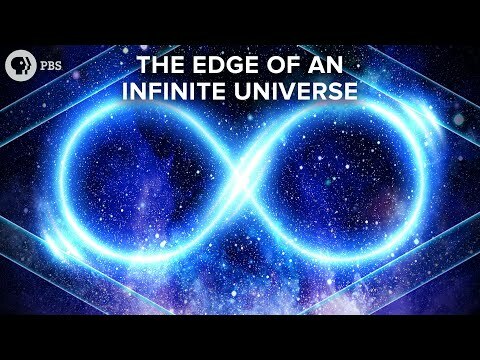 Have you ever asked "what is beyond the edge of the universe?" And have you ever been told that an infinite universe that has no edge? We can define a boundary to an infinite universe, at least mathematically. And it turns out that boundary may be as real or even more real than the universe it contains. Our universe may be infinite. In order to wrap our puny human minds around such a notion we like to come up with boundaries. which light has not yet had time to reach us. It's boundary is called the particle horizon. Our observable universe is like a tiny patch of land in a vast plain. homey and us less crushingly insignificant. We visited these cosmic horizons in one of the early Space Time episodes. cosmic event horizon defining the limit of the visible future. But these correspond to actual spherical boundaries in space, whose distances can be calculated. face of an infinite cosmos. our picket fence around an infinite universe. in physics, but may be as real as the physical universe it contains. It may encode that universe as a hologram on its surface. and this will set us up finally for laying open the holographic principle. Let's start with a quick review of types of universe. At least the three basic types described by Einstein's general theory of relativity. back on itself – like a 3-D analog of the 2-D surface of a sphere. We call that positive curvature. Travel far enough and you get back where you started. converge and cross each other. stay parallel – and it goes on forever. hyperbolic surface, like an infinite saddle or pringle. In this geometry parallel lines actually diverge from each other. Terrible name, so we abbreviate it AdS space. OK, so 2 out of 3 possible universes are infinite. in infinite universes compared to people in non-infinite universes. assume we're in one of the infinite ones. How do we put bounds on infinity? –to the edge of an infinite universe or across the event horizon of a black hole. Regular coordinates of space and time are useless there – they blow up to infinities. We call this process compactification. We have Kruskal–Szekeres coordinates, Eddington-Finkelstein coordinates, and others. It was Roger Penrose who defeated the true infinity of an infinitely large universe. conceived to understand the boundaries of the universe. and more space and time. The boundaries themselves represent infinite distance and infinite past and future. angles – all angles between intersecting lines relative to each other stay the same. We call such a transformation "conformal". Remember that word – it's going to be very, very important. ray of light remains at 45 degrees across the map. light speed paths can originate from these boundaries behind. also converge to this point which represents all of space in the infinite future. Only lightspeed paths – or in the language of quantum field theory "massless fields"
can access these diagonal boundaries. distance and calculate its behavior there. That has a very particular use. simple rules of non-curved, Minkowski spacetime apply. That's handy because flat space is the only space where quantum mechanics is fully solvable. The most famous use of this is by Steven Hawking, as we saw in our Hawking radiation episode. he could define the state of the quantum vacuum in solvable flat space. balance of a quantum field traced between them. state if a black hole lay between them. He concluded that the black hole must generate particles – Hawking radiation. we've discussed before and which I'll . review again - but not today. boundary to give us our hologram. Penrose diagrams define the infinite boundary of a flat universe as a useful tool in calculation. – an anti-de Sitter, AdS universe. Let's start with another map. angles preserved, and will compactify layers towards the edge. In fact, let's use the most famous conformal compactification of hyperbolic space. of hyperbolic plane called the Poincaré or conformal disk. The basic construction is straightforward enough – start with a circle. Any two paths that are parallel at one point will diverge from each other in either direction. on a finite disk, with lengths represented by shorter and shorter arcs towards the rim. The other feature of a conformal mapping is that shapes are preserved – at least locally. We see that when we fill the circle with a regular choice of circle segments. They define a set of enclosed shapes that vary in size but not in shape. This is an example of tessellation – tiling a space with regular repeated shapes. at a single instant in time. Each tile represent the same size region of space. The boundary is infinitely far away and looks the same no matter where we travel. If we wanted to represent a 3-D AdS universe we could use a Poincaré ball instead. But the real power of AdS space isn't the cool art you can do with it. It's the nature of the infinite boundary. Minkowski space with one fewer dimension. In fact let's add the dimension of time to our hyperbolic projection. Stack a bunch of Poincare disks – each representing an instant in time. dimensions – let's call that 2+1 dimension. – and the same one-D of time – 1+1. coordinates of the interior volume - is mathematically exactly a flat, Minkowski space. – also called the "bulk" - as separate spacetimes with their own physics. – remember those circle arcs? Patterns on the surface define the structure of interior. That structure looked exactly like a string theory with gravity and everything. This is the AdS/CFT correspondence. gravity in a space with one higher dimension. distant boundary of the higher dimensional space. on an infinitely distant surface. OK, I'm going to have to cut us off here. The deeply abstract relationship between these two spaces needs an entire episode. Your excitement at our possible doom really showed in your comments. Many of you asked what happens to black holes in the big rip. So I thought that the answer was that black holes would be eroded into nothing. and the black hole to dissolve. Some internet physicists agree with my intuition. to produce a global state where everything just looks like an inflationary spacetime. Chris Hanline wisely notes that dark energy appears to break the conservation of energy. global properties of the spacetime don't evolve over time. In fact conservation of energy comes from this symmetry, as revealed by Noether's theorem. the past looks very different to the future. just different interpretations of the math. experience for any sentient life still around at that point. Well it wouldn't be great, that's for sure. destruction of the solar system would happen pretty fast. the destruction of atom sized things where you have the destruction of people-sized things. disrupt the way chemistry works, without actually ripping matter apart. to hours of bad times as our molecules start to betray us. To make matters worse, the Earth would be falling apart at the same time. It's like 2012 meets World War Z meets Chronicles of Riddick. Guys, I think we just sold a movie.